To be honest I really didn't expect to enjoy this book that much. The synopsis didn't do much for me and I didn't like the cover either (sorry). I was only interested because I'm always looking for the next best YA contemporary romance. But just 4% into the book (says my Kindle app)... MAN WAS I HOOKED. You know how they say never to judge a book by it's cover? Totally true! Grace. 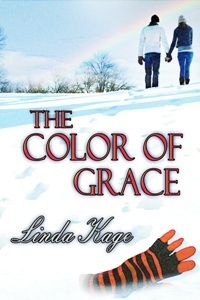 Linda Kage created such a relatable and lovable main character in the form of Grace Indigo. She's a total nerd (her group of friends are is called the nerd herd) but she's not socially awkward in any way... except maybe when she first met Ryder. What I loved about Grace was how she dealt with all the craziness around her. She used to be a nerd until she moved to a new school. She didn't necessarily become cool but she did get labeled cool by association. She started hanging out with the cool kids, and two totally hot guys were fighting over her (although it's not because both like her, the other one's just trying to piss Ryder off) but she didn't lose sight of who she truly was. I just hate it when female protagonists go down the Cady Heron route (you know, Mean Girls). It makes for a good story, but often times I just get frustrated. Anyway, I think Grace was an overall great character. I loved her from start to finish. With no other witty lines left in my arsenal of comebacks, I panicked. Tucking my camera close, I spun from Mr. Perfect and scampered off. COME ON!!! Can we all just take a moment to appreciate Ryder Yates. And we're back! Aside from the utter smoothness (that didn't come out right) and obviously gorgeous exterior, what made me swoon and go crazy with the Kindle app's highlighter was how honest Ryder was with Grace. He was very vocal with his feelings for Grace - there were no mind games! Ryder wasn't like most hot/cool guys usually present in YA books nowadays and I liked that. Conflict. Totally didn't see that coming. Well... along the way you'll somehow know but I didn't expect the climax of the book to be that! I was actually glad the conflict was something off tangent. It was a surprising turn of events but in a good way. Colors. Every chapter in the book starts with Grace figuring out which color best describes her and I think it was nice reading her insights. I think it made the character building better and it definitely added more depth to the story. But that's just me. It's just that I've never really given much thought to colors and it was nice seeing how Grace characterized colors, all the possible meanings behind them and who she associates them with. No, I can't explain myself further because I'll only end up spoiling it for you. Yes, I still think it's a great read. No, I do not ship Ryder and Grace. Great book review! I especially like your insightful comments about Ryder's emotional honesty & vulnerability when you say, "What made me swoon and go crazy with the Kindle app's highlighter was how honest Ryder was with Grace. He was very vocal with his feelings for Grace - there were no mind games! Ryder wasn't like most hot/cool guys usually present in YA books nowadays and I liked that."